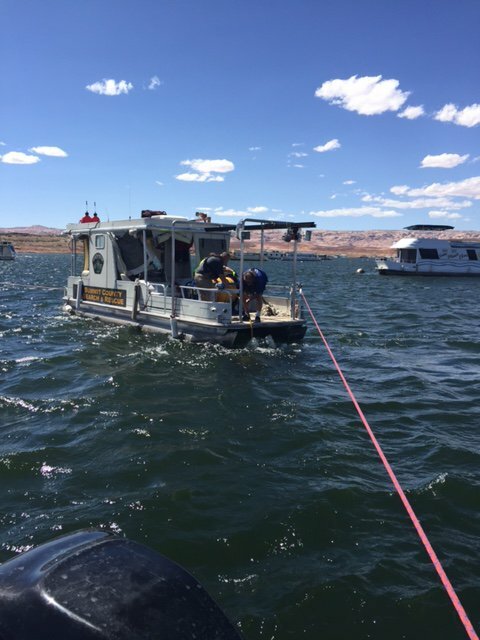 ST. GEORGE — Officials Monday have recovered the body of an 18-month-old child who is presumed to have fallen overboard a houseboat at Lake Powell Saturday night and drowned. Just before 2 p.m. Monday, the body of Alleyah Janett Bell, of Orangeville, was recovered from the Hall’s Crossing buoy field, according to a statement issued by the San Juan County Sheriff’s Office. Following a two-day search, the Utah Department of Public Safety Dive Team located the child at approximately 1 p.m. in 240 feet of water using sonar equipment, the Sheriff’s Office said. The Summit County Search and Rescue deep water robot was used to recover her body because the depth was too deep for divers. The little girl had fallen into the water from a houseboat that was tied to a stationary buoy at Hall’s Crossing Saturday night about 7:30 p.m., officials said. The child had not been wearing any type of life preserver, according to officials. The child’s body was taken to the Utah Medical Examiner’s Office to confirm the cause of death. The investigation is ongoing but there is no evidence of foul play. For the love of God, can’t mothers put life preservers on small children on houseboats? Especially when the mothers are partying with others on the boat. This is the second small child lost in the last few weeks in almost exactly the same circumstances. Am I the only one upset by this? We need to permanently close Lake Powell to boaters and houseboats. It’s obvious that Lake Powell is the culprit for mass killings, especially of children. Remember the liberal logic- if we can save even ONE child, we owe it to ourselves to ban that which kills! I agree. ! let’s drain the lake and turn it into a golf course and low income housing and sell the water to California. ! See? !- A solution to the problem that saves lives AND makes someone rich at the same time! I’m upset to AH. I know when I was a child my parents made sure I had a life jacket and I did the same for my children. I don’t understand why anyone would let a child go on a boat without one. I hate to be a broken record, but I too would like to know why anyone would all a child on a boat without a life preserver. Are the people who rent these boats not making it clear that it’s required or at least mentioning it? I would expect better from someone who actually owns a boat and should have gone through some safety training. So sad, and even sadder, so preventable!